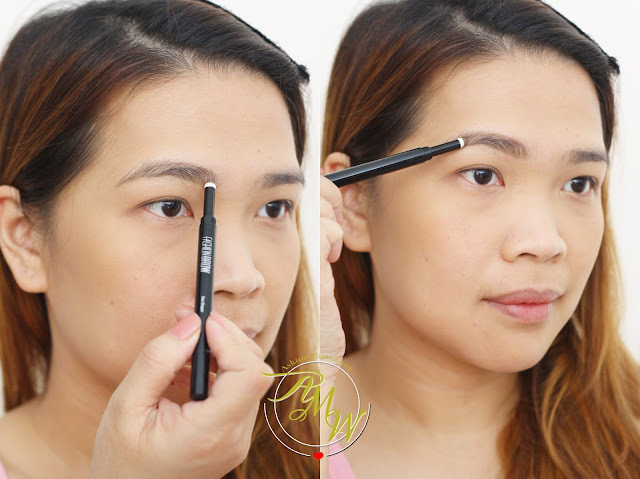 Maybelline Fashion Brow Duo Shaper is Surprisingly Good! I've had the Maybelline Fashion Brow on my dresser for months now! I realized, on days I am in a hurry, I tend to pick this up and just fill in my brows with both the pencil and powder and I'm ready to go! I can even skip my favorite Brow Mascara! The Maybelline Fashion Brow Pencil is called an all-in-one pen for brows! The uniqueness about this is that, the pencil portion contains 0.2 mm micro lead fixing pencil that makes it very convenient and easy (even for first-time makeup wearers) to fill in brows with minimal to almost no mistakes! On the other side is the pointed sponge applicator to fill in brow powder! This smudger reminds me so much of the Maybelline Color Sensational LipGradation, same smudger sponge but a tad bit smaller. The shade I got is Light Brown, the other shade you may choose is called Brown. If you have colored hair, go for light brown! It's easier to work with light colored brow products than dark! As for application, the AMW way is to fill in sparse areas with pencil using short, light strokes! You don't have to worry about making a huge mistake because the pencil side isn't heavily pigmented like eyeliner! I like it that it gives only a "blurred" color so this is proven to be friendly even for first-time makeup wearers! Some would like to outline the brows but I prefer to create natural-looking brows by gently mimicking the look of brow hairs! ONE AT A TIME. Once you're happy with the thickness and shape of your brows, now it's time to create a more natural-effect! You know how pencils show obvious demarcation marks right? With the power of brow powder, it blurs out everything thus making your brows look very natural at the same time, gives a slight tint! Now the only issue for me with regards to this product is that, it isn't as long-lasting and waterproof as I'd like it to be! So what I would usually do is to add on an extra step of applying a transparent brow mascara just to "set" everything in place! That way, the brow powder has "something to stick on" making it stay longer than usual. 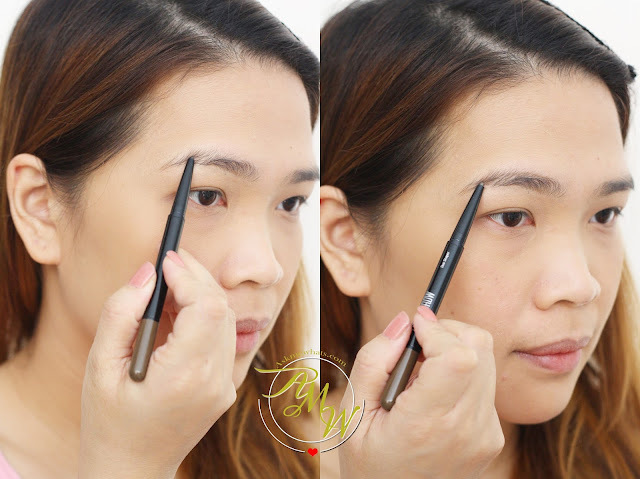 Bare brows, Brows with Maybelline Fashion Brow Duo Shaper Pencil and lastly, with Brow Powder. Maybelline Fashion Brow Duo Shaper is priced locally at Php399.00 (approx $9.00) available in all Maybelline Counters nationwide. How do you like my "after" brows? Your eyebrows don't even look drawn. Really cool. what?? They do??? How come?